I am not a ghost blogger who writes fiction, I am a lifestyle blogger who writes truth. I share my real-life stories. LOL. For lack of what to put up today, I thought to give you this gist. I have a private Facebook account. I don't accept any request from anyone I do not personally know. It's strictly limited to close friends and family. Personally, Facebook is a small world where my friends know my friends. Virtually everybody knows everybody. There are certain things I can't share on other social media outlets because they have little or no preference on privacy settings. But on Facebook, I can give the minutest details about anything without fear (if I want to). Having said that, my mum's birthday was only few days ago. I wished her a happy birthday and flaunted a picture of her and me on my timeline (Facebook). And I tagged my mum so she could see it. Every one prayed and sent wishes for my dear mum but this particular one was different. It was posted by a friend - a male. Let me tell you a little about this human being of a male specie; Firstly, he is one of the guys in the picture I posted here. I've known him for over 8 years now. He was born to be a comedian but. . . he mistakenly works in a bank. He makes a joke out of everything. There is never a dull moment with him. Plus, you can never tell when he is serious and when he is not. He is that kind of person who says 'Happy Married Life' on your birthday. He is funny like that. "congrats to my mother in law"
My mum suddenly started asking questions about him. Lmho! I laughed to the point of tears. I'm yet to decide on how to deal with that human being of a male specie. Have you got any idea? I would have probably deleted his comment if I'd seen it earlier. But my mum saw it before I did. I wasn't aware until she asked; "who is (insert name here)? 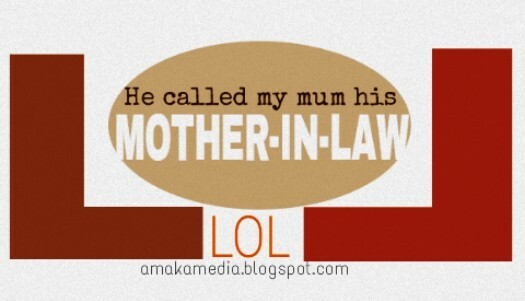 He said I'm his mother-in-law" "Huh?! What?! Are you kidding me?!" I was shocked. That was how I started explaining what that human being of a male specie is to me. He is a naughty friend I met in school. Anyways, I told her it was all a joke. Her potential son-in-law will not propose in that manner. He is definitely not the one. I have some crazy friends in my life. I mean 'crazy' in a good way. I love them. And I'm grateful for them. Hahahahahaha..........are you sure he is not the one? Happy belated Birthday to your mum! I Love this post. I don't know why. Your beauty, kindness, and warm heart are all from your mum. You two look very alike. Wishing her many many happy returns of the day! Amaka don't you think he might be a playful replacement for magic...lol... Happy birthday to your mum.. There is indeed a point to this beautiful post, and it’s anything but gist. You’re sharing about something profoundly intimate and important, and my respect for you has grown immensely because of it. Your mother and friends are part of your world in a very real way. Her picture reveals that she is a very beautiful woman and anyone can see the light of her soul in her countenance. You share that same light. You are not just a sweetheart on the blog, you are one in reality. I keep loving you everyday girl. Can I be join your facebook family, pleasee? This guy is making his intentions known now and you're calling him a joker, izokay. Happy belated birthday to your mama. Hmmmm clears throat. My dear this i have seen this kind of joke that turned out to be real. I wish you the best anyways.. Happy birthday to your beautiful mum. Amaka and Emeka........hmmmmmmmmmm.......d names rhyme gan...........hmmmmmm.......we are watching. Happy birthday to ur mummy in arears. Loooooooool. You sef see am. Nice one.I have crazy friends too. They make you laugh and forget sorrows. You can say that again, Xeexee! Ah Chummy, you will love him. I dash you. @ Amaka give the brother a chance. @Emeka call her everyday morning and night. I remember that was what she tols us one Jerry did to win her heart. Thank me later. Aww. . . thank you. God bless you, Obiri. I actually look more like my dad. Like seriously. 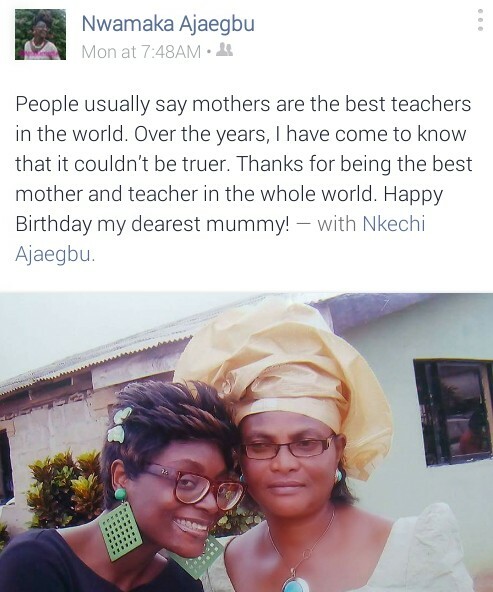 Happy birthday to your pretty mama.. Erm Amaka just so you know, there is no smoke without fire. I will remind you of this word when I am dancing with you on your big day.